Hydrangea ‘All Summer Beauty’ began to bud last week. The toad lilies have gaily seeded themselves everywhere, as have a species Geranium (G. maculatum). Both have the good grace to be easy to remove (once the temps drop below 92, I’ll think about it . . .). What bugs me most is the constant proliferation of spiderwort (Tradescantia), which spreads by runners all over the damned place. It’s the blue-flowered perennial below. You can’t get rid of it without digging out the roots, which is an almost impossible task. I’ve settled for cutting it back at the base, knowing it will come back. Tradescantia (spiderwort) and Indian pink have spread in this border without any encouragement from me. I’m happier about the spread of the Indian pink (Spigelia marilandica), shown above with the red blooms. I ordered three plants of it many years ago from an online nursery. Today I find it throughout the garden. It likes shade – what a surprise to see such a strong red color in a shade garden! ‘Lady in Red’ fern has red stems. Another perennial with a little red in it that has spread unexpectedly in my garden is the fern ‘Lady in Red’ (Athyrium felix-femina ‘Lady in Red’). It was a new introduction when I splurged on it (having lots of deer who wander through the garden has increased my interest in and respect for ferns, which they avoid). But now I’ve found it a hundred feet away from where I first planted it. No problem for me. Other plants I’ve been happy to see self-seed in my garden include dwarf goats-beard (Aruncus aesthusifolius), another stalwart for the shade, and – to my great delight – the lacecap hydrangea H. macrophylla ‘Blue Billows,’ which has appeared in two locations other than the two where I originally planted it. Now there’s a real bargain. ‘Blue Billows’ in my back yard, with ferns and a variegated boxwood in the background. Last summer, as I was nearing the end of my photo-a-day project (or rather, its extension after the workshop ended), I ventured across the bridge to Arlington, Virginia with a friend from the class. We were exploring the Crystal City/Rosslyn area, which consists primarily of large office and apartment buildings centered around the Crystal City Metro stop. Sarah wanted to check out some galleries, but afterwards we walked around and eventually stumbled onto the Long Bridge Park area. The park, which has three full-size, large athletic fields and an elevated walkway planted on either side with native perennials, is near I-395. The walkway offers views of the Potomac River and flights taking off from National Airport. The walkway over Long Bridge Park offers views of the National Monument. County residents have authorized a bond offering that would help fund a large aquatic center, but the County Board recently shelved plans as construction bids came in too high. Nonetheless, the athletic fields apparently are quite popular. And as we wound up our walk in downtown Crystal City, we found the other end of the Park’s offerings, a beautiful ‘water wall’ installation that helped cool us off on a hot July afternoon. These water walls and plantings (looked like feather reed grass to me!) in the downtown area of the park help provide green space for all the surrounding office buildings. “Pool of Bamboo Counterpoint,” by Hugh Livingston, at Dumbarton Oaks. Livingston’s sound “piece” follows on other temporary art installations that have graced other parts of the garden in past years, including Patrick Dougherty’s “Easy Rider” installation in the Ellipse, which I wrote about in an earlier post. After investigating the pool installation, I spent several hours in the rest of the garden – the weakening fall sun was low enough that photography was less challenging than I’d anticipated. Hope you enjoy the show. Dumbarton Oaks is located at 31st and R Streets NW in Washington DC. 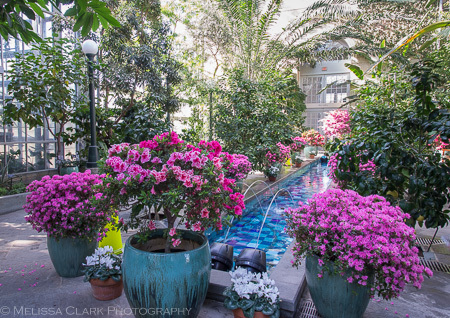 From now until March 15, 2015, the gardens are open only in the afternoons from 2 – 5 pm and admission is free. The containers on the Arbor Terrace looked wonderful. The Herbaceous Border in late afternoon sun. Asters and chrysanthemums in the Herbacous Border, with Amsonia foliage coloring a bright yellow. Light on salvia in the Cutting Garden. Shadows on the gravel walk in the Ellipse. Hornbeam trees encircle the space. The Beech Terrace. Need I say more? A Farrand-designed iron gate frames a view into the Urn Terrace and fall foliage beyond.